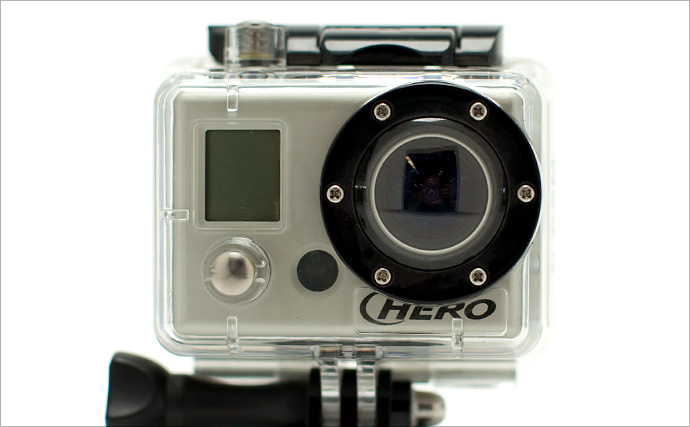 Box shot – the GoPro Hero in it’s protective case. I was lucky enough to be able to borrow a GoPro HD camera last week and I’ve just spent a few days trying it out around Sydney. Included in this rigorous testing regime was a full-day ride with a bunch of mates in some glorious weather north of Sydney. But more on that, and the footage I captured, in another post. First things first. 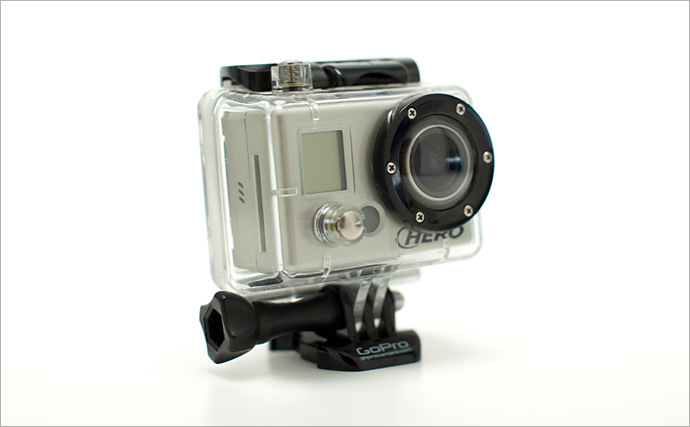 The GoPro Hero HD is a tiny 5-megapixel miniature point-of-view video and stills camera that mounts to your bike and takes wide-angle HD quality movies and pictures while you ride. Included in the kit is the camera itself, a battery, a waterproof plastic case, leads, and a whole bunch of mounting options centred around a GPS-on-your-car’s-windscreen-style suction cup. SD memory cards handle the storage duties – I didn’t hold back during a full day’s ride and managed to only use 10 gig in total. I found that the battery life of 2.5 hours petered out well before any SD overflow occurred. I set the quality to 720p at 25fps, but it is capable of both 50fps at the same quality and a maximum of 1080p at 30fps. Fair to say, then, that it’s not short of image resolution. This is backed up by a decent-looking lens and a quality sensor to go with it. Watching the footage I recorded is definitely a pleasant experience – judging by the videos I watched on YouTube while researching this review there’s plenty of POV cameras out there that fall way short of the GoPro in image quality. Two things bothered me with the mount. The first was its limited positions. The hinged arm lacks the ability to swivel a full 360˚, which means if you want the camera facing forward you only really have two options – the top of your tank or a section of faring on the side of your bike. As far as I could tell, if you wanted to mount the camera on your windscreen or headlight surround and point it forward you couldn’t. At least not with the parts I was supplied. 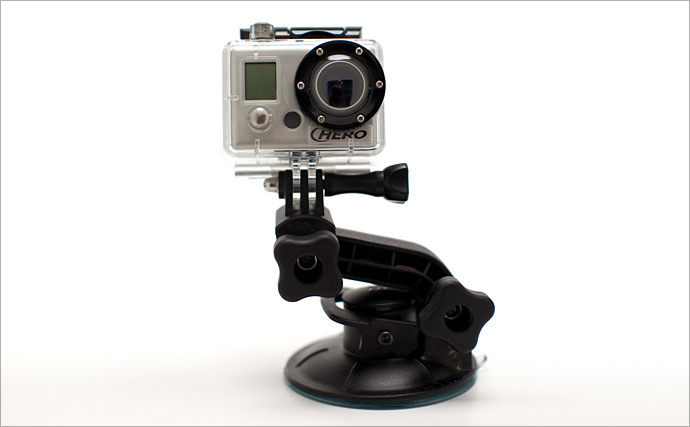 A simple ball and socket mount would fix this issue and allow GoPro users complete freedom when positioning the camera for a shot. Add this to the fact that the mounting arm didn’t seem all that stable and I was mentally redesigning the thing by the end of the day. At speed it seemed to do more to amplify the bike’s vibrations than quell them. Surprisingly though, the camera delivered the goods in terms of decent shots. I think the extremely wide-angle of the lens helped a lot here; as any photographer will tell you the more wide-angle a lens is the less shake you get in your shots. I was left thinking that the results were pretty good, but couldn’t help but wonder what they may have been like if the mount was able to keep the camera a little more steady. Put simply, I think the mount lets the side down. The camera has plenty of programmable options to allow you to do some very handy things like continuously take still shots every “x” seconds, customise the camera’s auto-off settings and the like. Unfortunately all these choices are buried in a user interface that was so unintuitive it’s like trying to talk to aliens. I had no choice but to take the instruction manual with me on all my rides just in case I wanted to change something. In my book that’s a black mark next to the GoPro’s useability rating. When’s the last time you had to read up on how to work your iPod or Xbox? The other frustration was the inability to quickly and easily tell whether the camera was actually recording. There is a red flashing light on the camera, but unfortunately it’s placed on the front face, which spends most of its time facing forward and away from the rider. The upshot here is that when you’re on the move you just have to press the button to start recording and hope that it has “registered”. Likewise when you want to stop recording. Chances are that at some point during your ride you’ll either miss recording a moment you thought you had in the bag, or you’ll burn through your battery and memory space recording blue sky or the inside of your backpack. There’s also a safety aspect to this issue as I spent quite a bit of time checking the camera’s recording status rather than keeping my eyes on the road. Attention GoPro dudes – the simple addition of a two-position switch would be an easy remedy to this issue and make your product a whole lot safer to use. Relative of the PIXAR desk lamp? In the end the results the camera is capable of producing probably outweigh the cryptic interface and some awkward mount design. Looking back at the footage I captured, it’s decently exposed, very sharp, colourful and great to look at. 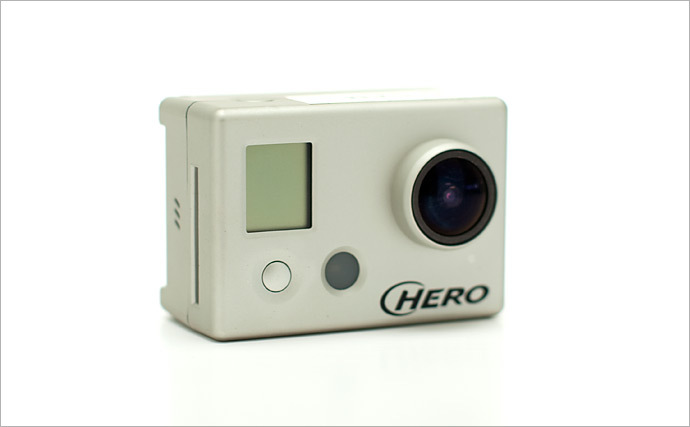 I can’t help but thinking the GoPro Hero HD is a 10/10 camera trapped in a 5/10 product. If you’re into the idea of recording your rides for posterity then there’s pretty much nothing else on the market that comes close to the GoPro for the US$300 asking price. But would we recommend it? It’s close, but I think that the issues i’ve flagged above puts it firmly into the “good not great” category. On the other hand, if you think you can live with a few wobbles, limited mounting options, and an arcane interface the GoPro HD may well be for you.